So You Think You Know Zombies? Zombies are all the rage right now (have been for a while). Scooby Doo is the gateway drug from zombie-lovers. Zombieland made the undead almost funny (poor Bill Murray), and Brad Pitt helped us fall in love with zombies on crack in World War Z. The Walking Dead phenomenon took normal, unassuming quiet people and turned them into full fledged fans of the rotting flesh-bag battle. Resident Evil gave the gamers a taste for the zombie scourging. And of course, for classic zombie-fans, there will always be those old-school blood-and-guts-everywhere films from the 70’s and 80’s. I’m not a huge fan of zombies. I did read Pride and Prejudice and Zombies by Quickbooks (soon to be a movie in theaters). 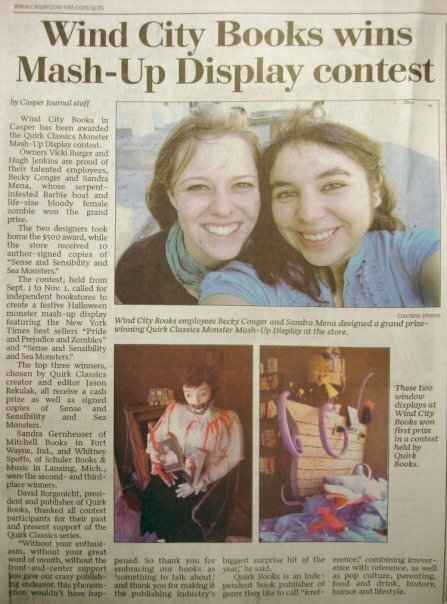 Working for a book store at the time, my coworker/bestie and I put together a book display for it that won us $500 for best display in North America. Confession #2: I also acted in a short zombie film in college. I played the role of a doting mother to my child-born-zombie. OTHER THAN THAT, I’ve never had a thing for undead movies or ghoulish dress up. I have never particularly enjoyed the gore and guts of Halloween. (This blog post helped me see the potential in Halloween, making it almost my favorite holiday ever.) 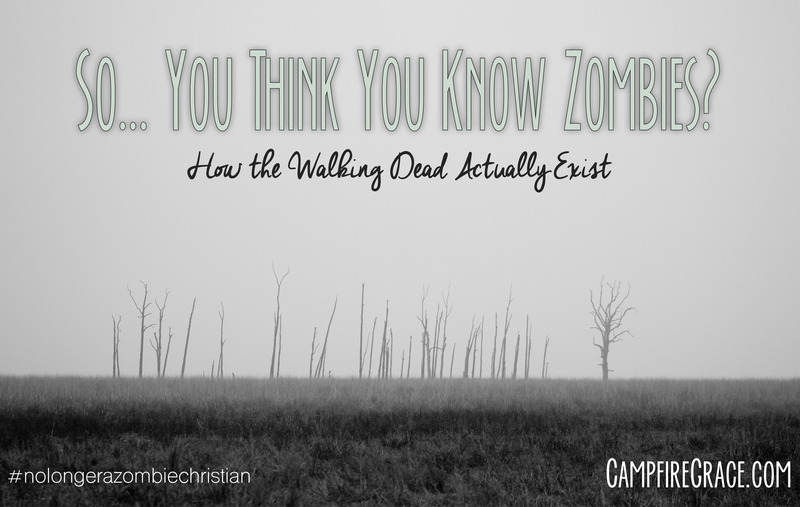 However, I think that zombies have a place in the Christian conversation. Believe it or not, zombies are mentioned in the Bible. Ok, not actual dead corpses eating brains on the road to Damascus. But Paul talks about the “living dead” quite often. Sound like a zombie apocalypse? That is God’s perspective of our lives when we are not in relationship with Him: dead dead dead. Our sin separates us from a holy God. God’s great love pursued us in our grave-living. Jesus took the place of our death, our separation. He then rose again and had victory over our identity as dead people. When we accept Jesus death as the payment for our sins, we also come to life. You can make that decision now: simply surrender to God. We have a beautiful symbol of this “dead come to life” thing. When a Christ-follower is baptized, they go beneath the water to symbolize burial of the “old” dead person. When they come out of the water, the believer is showing that they are a alive in Christ! Of course, we do not believe that believers baptism “saves” us. It is simply a picture of salvation… dead come to life in Christ! So who do you know that might need to hear about this life-gift from Jesus? Maybe you need to accept it for yourself and begin your journey as a Christ-follower. Perhaps you have someone else in mind that is searching for fulfillment in dead-ends, like a zombie hunting for brains. Send her this link, or post it on your social media site. Check-in Question: What evidence does your life show that you have life in Christ? Great post as always Becky! I think right now God is working with me to remind me that I just can’t be in control of everything. Someone once told me “God isn’t favorable to the foolish who don’t plan, but at the same time, God has a plan of his own.” I’m dealing with that now as I try to figure out what my plans are after graduation, and there is so much uncertainty that I feel God telling me to stop trying to make plans. I’m extremely Type A, so I’m working on it… prayers for trust and grace would be super helpful. I’ll be praying for guidance, discernment, patience, and most of all a deeply centered reliance to keep leaning into Jesus through it all. Great thoughts! I just started reading Francis Chan’s book on marriage and he used the passage from Ezekiel 37 with the dry bones coming to life to talk about how different our lives and marriages should look. God did not want us to miss this great truth and He wants to bring the world to life through seeing the church, alive!